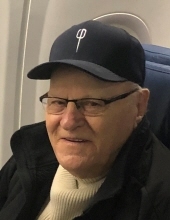 Age 80, of Hudsonville, passed away on April 5, 2019 at University of Michigan MetroHealth Hospital in Wyoming, MI. He was born on February 23, 1939 to Kenneth and Gertrude Herrick in Owosso, Mi. Larry was a proud veteran of the United States Navy, and served on the aircraft carrier USS Forrestal. He was a member of the American Legion Post 179 in Walker, MI and the Fraternal Order of Eagles Aerie 3201 and the Loyal Order of the Moose 1616 in Houghton Lake, MI. Larry is survived by his sons, Bruce (Yvonne) Ford and James (Anna) Herrick; grandchildren Heather (Jeff) Williams, Jeremy (Brittany) Dutcher, Eric (Rian) Ford, Rachel Ford (Teri Cherkowich), and Jessica Olearczyk; great-grandchildren Jenna, Katelyn, and Kyler Williams; Jordan Dutcher; and Mackenzy and Natalie Ford. He is also survived by his brothers Jerry Herrick and Doug (Sandy) Herrick; his brother-in-law Richard (Rose) Gillett, several nieces and nephews, and many friends. He was preceded in death by his wife, Marie (Gillett); his daughters Linda Dutcher and Kathy Ford, and his parents. In keeping with Larry’s wishes, there will be no visitation. Funeral services will be held on a date to be determined at Great Lakes National Cemetery in Holly, MI, where his ashes will be inurned. Memorial contributions are suggested to the Cancer Center at Metro Health Village, in care of Metro Health Foundation, 5900 Byron Center Ave SW, Wyoming MI 49519. To send flowers or a remembrance gift to the family of Larry Orcit Herrick, please visit our Tribute Store. "Email Address" would like to share the life celebration of Larry Orcit Herrick. Click on the "link" to go to share a favorite memory or leave a condolence message for the family.